The James K. Polk Dollar was released on August 20, 2009. 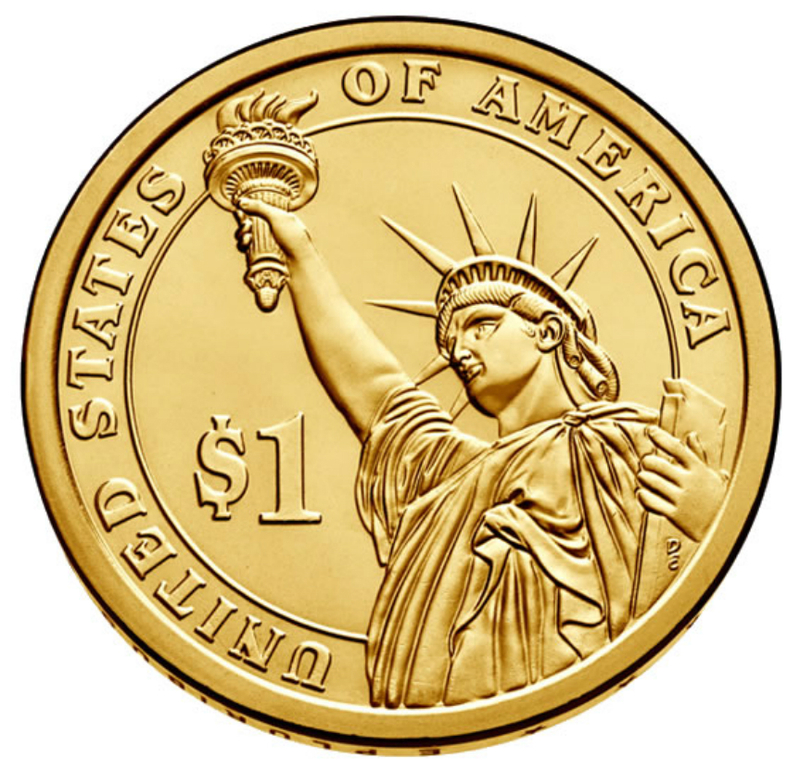 It represented the eleventh release in the ongoing Presidential Dollar series, and the third release for the year 2009. James K. Polk was the 11th President of the United States of America. As a strong proponent of “Manifest Destiny,” he oversaw the expansion of the country by more than 1 million square miles during his term. Present-day Oregon and Washington were annexed from Great Britain, and California and New Mexico were added through the Treaty of Guadalupe Hidalgo. 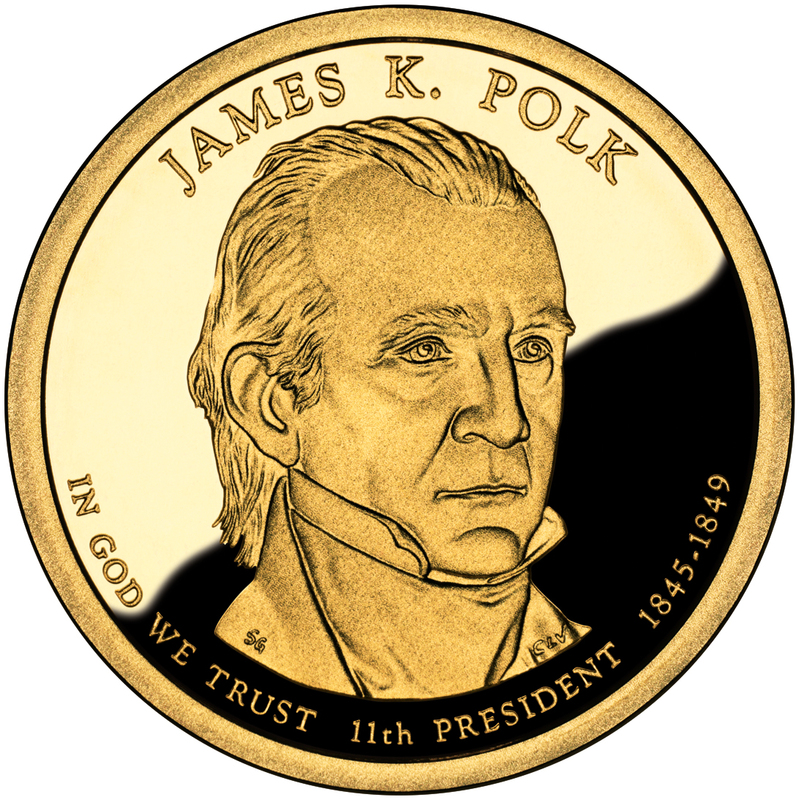 An official launch ceremony was held for the James K. Polk Presidential Dollar to coincide with the release of the coins into circulation. The ceremony was held on May 21, 2009 in Columbia, Tennessee at the former ancestral home of James K. Polk. Attendees included Andrew Brunhart of the United States Mint, John Seigenthaler, renowned author and journalist, and John Holtzapple, director of the James K. Polk House. The reverse of the coin features the Statue of Liberty, as designed and sculpted by Don Everhart. This design representative of the concept of Liberty has been used throughout the series. 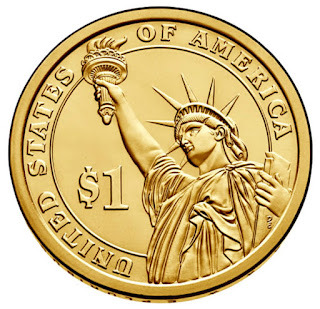 As a change from prior years, the placement of the “In God We Trust” motto appears on the obverse of the coin. The other famous motto “E Pluribus Unum,” the date, and mint mark will continued to appear on the edge lettering of the coin. 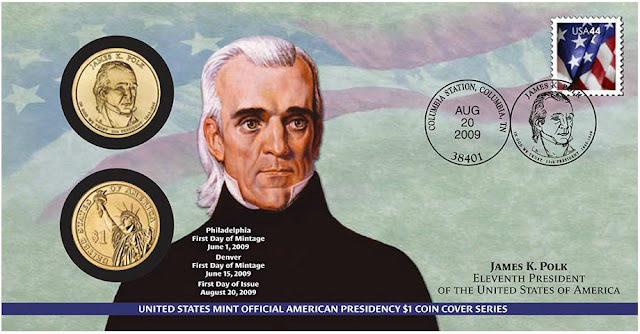 The mintage for the James K. Polk Dollar showed a slight increase from the levels of the prior release of the series. There were a total of 88,340,000 coins produced for circulation at the Philadelphia and Denver Mints. James Knox Polk (November 2, 1795 – June 15, 1849) was the 11th President of the United States (1845–1849). Polk was born in Mecklenburg County, North Carolina. He later lived in and represented Tennessee. A Democrat, Polk served as the 13th Speaker of the House of Representatives (1835–1839)—the only president to have served as House Speaker—and Governor of Tennessee (1839–1841). Polk was the surprise (dark horse) candidate for president in 1844, defeating Henry Clay of the rival Whig Party by promising to annex Texas. Polk was a leader of Jacksonian Democracy during the Second Party System. His nickname was "Young Hickory" because of his close association with "Old Hickory", Andrew Jackson. Polk is often considered the last strong pre–Civil War president, having met during his four years in office every major domestic and foreign policy goal set during his campaign and the transition to his administration: When Mexico rejected American annexation of Texas, Polk led the nation to a sweeping victory in the Mexican–American War, seizing nearly the whole of what is now the American Southwest. He ensured a substantial reduction of tariff rates by replacing the "Black Tariff" with the Walker tariff of 1846, which pleased the less-industrialized states of his native South by rendering less expensive both imported and, through competition, domestic goods. He threatened war with the United Kingdom over the issue of which nation owned the Oregon Country, eventually reaching a settlement in which the British were made to sell the portion that became the Oregon Territory. Additionally, he built an independent treasury system that lasted until 1913, oversaw the opening of the U.S. Naval Academy, the Smithsonian Institution, the groundbreaking for the Washington Monument, and the issuance of the first United States postage stamp. True to his campaign pledge to serve only one term as President, Polk left office and returned to Tennessee in March 1849. He died of cholera three months later. Scholars have ranked him favorably on lists of greatest presidents for his ability to promote, obtain support for, and achieve all of the major items on his presidential agenda. Polk has been called the "least known consequential president" of the United States.